Location: At the intersection of Viale Castrense and Via Nola, half way from San Giovanni in Laterano to Porta Maggiore. Amphitheatre Castrense is a small amphitheatre, constructed of brick and concrete, dating from the reign of Trajan. Its name could either mean of the Imperial Court or of the military camp. 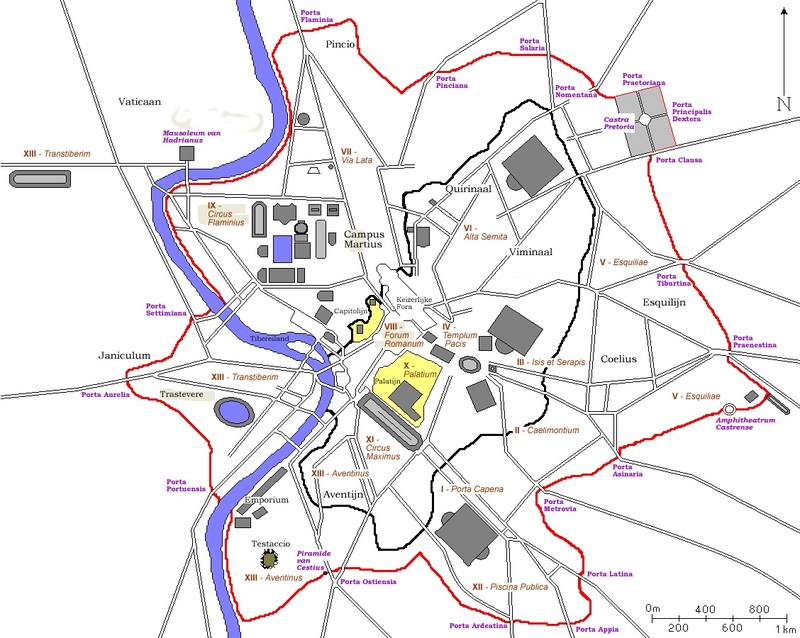 It is too far from the Camp of the Praetorian Guard to be connected with that, so the imperial connection is usually accepted. 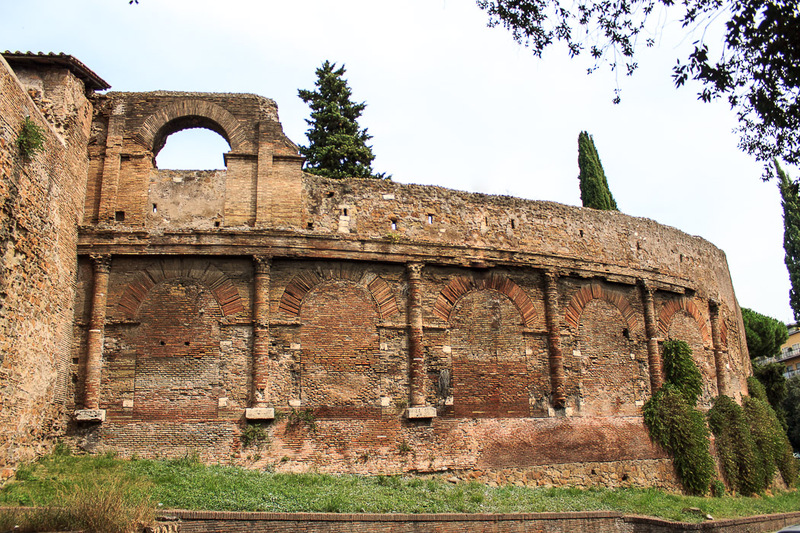 In 271 AD the Aurelian Wall was constructed and the amphitheatre was incorporated into the wall. The ground floor arches were filled-in to form part of the defense and the upper stories were demolished. See all Amphitheatre Castrense photos. Porta San Giovanni (1st, 2nd, 3rd, 4th and 7th photos below) is a modern gate in the Aurelian Wall of Rome named after the nearby church of San Giovanni in Laterano. It is a single large arch built of travertine for pope Gregory XIII in 1574 to replace the neighboring and more imposing Porta Asinaria (5th and 6th photos below), which was part of the Aurelian Wall, which by the 1570s was unable to keep up with the high level of traffic and the rising street level in the area. 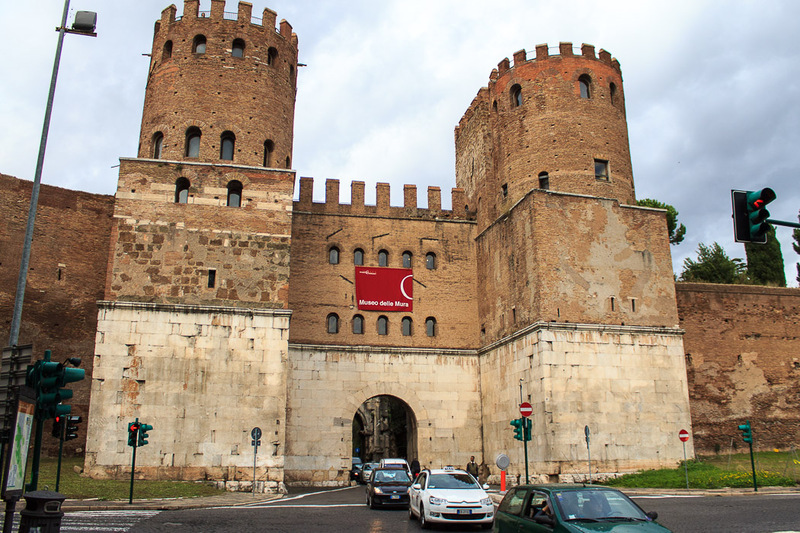 Porta Asinaria is the gate by which the Gothic king Totila entered Rome in 546 during the Sack of Rome by the Ostrogoths in their war against the Byzantine Empire. Today's gate is not defensive, but rather more like the entrance to a villa. On the external side, a large bearded head is at the top of the arch. See all Porta San Giovanni photos. See all Aurelian Wall photos. 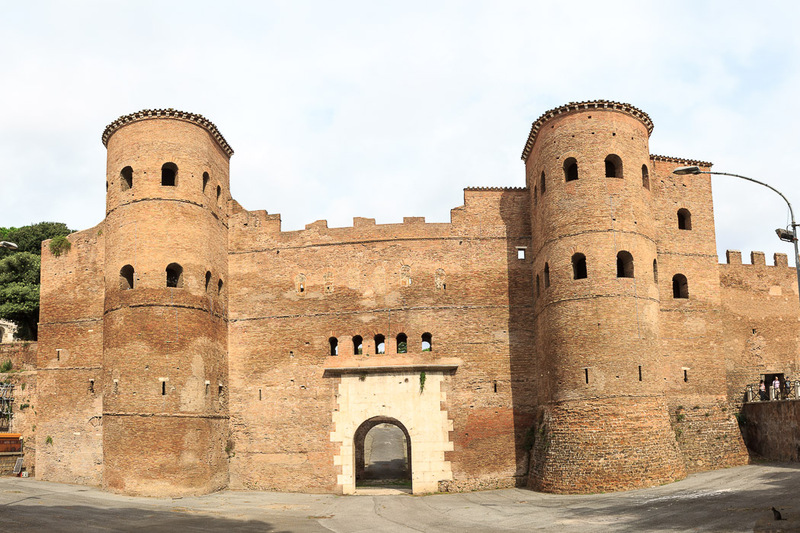 The Porta San Paolo is one of the southern gates in the Aurelian Wall. 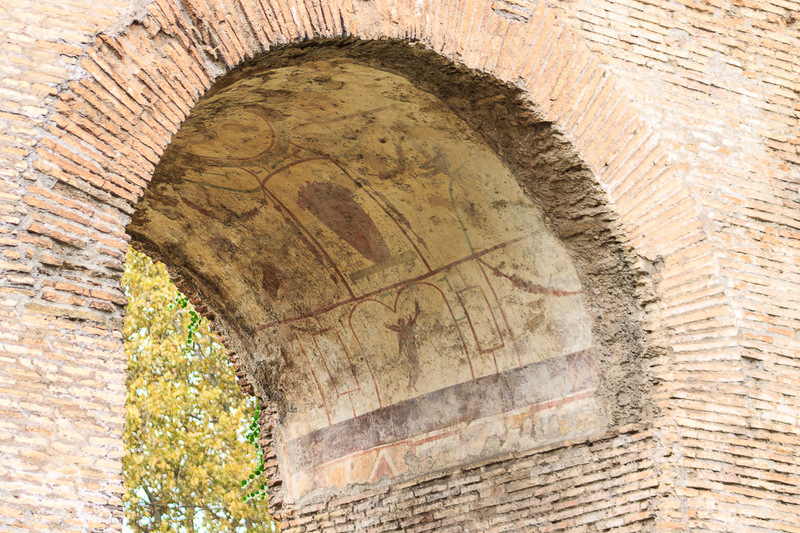 Originally it was called Porta Ostiensis because it is locate at the beginning of the Via Ostiense, the road that connects Rome with Ostia. 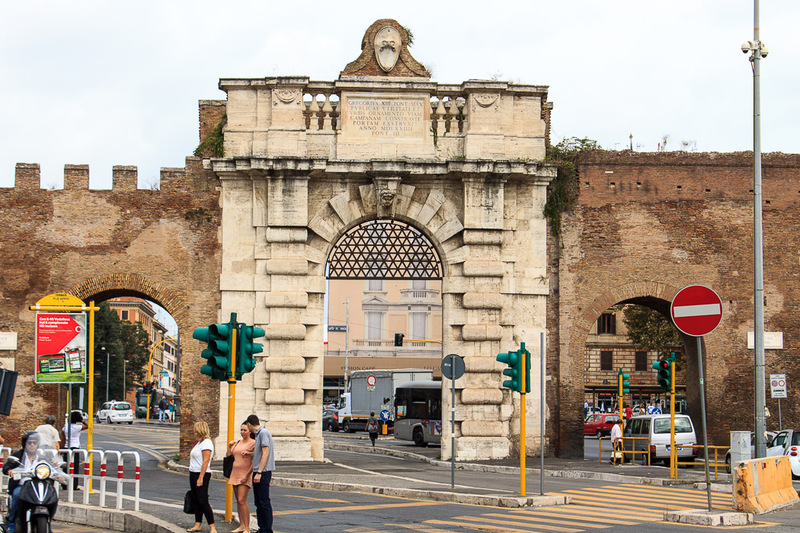 It was later renamed to Porta San Paolo because it is the gate that leads to the basilica of St. Paul's Outside the Walls. The gate is massive, flanked by two cylindrical towers, and has two entrances which have been covered by a second single-opening gate built in front of the first between 530 AD and 540 AD. 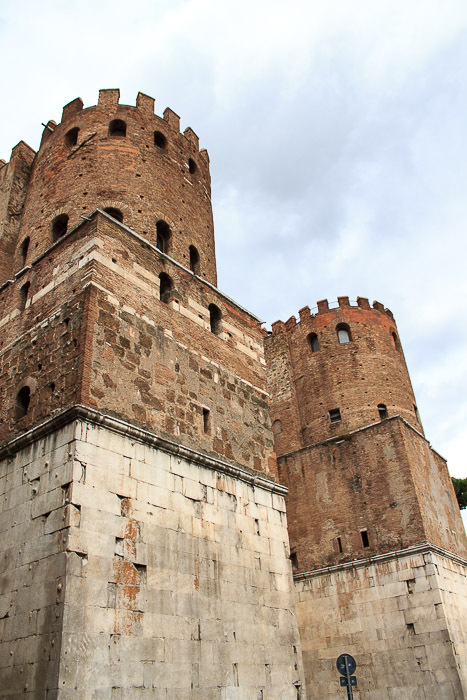 Maxentius had the gate built, and the two towers were made taller by Honorius. In 549, when Rome was under siege, the Ostrogoths of Totila entered through this gate. The Ostiense Museum is housed within the gatehouse. 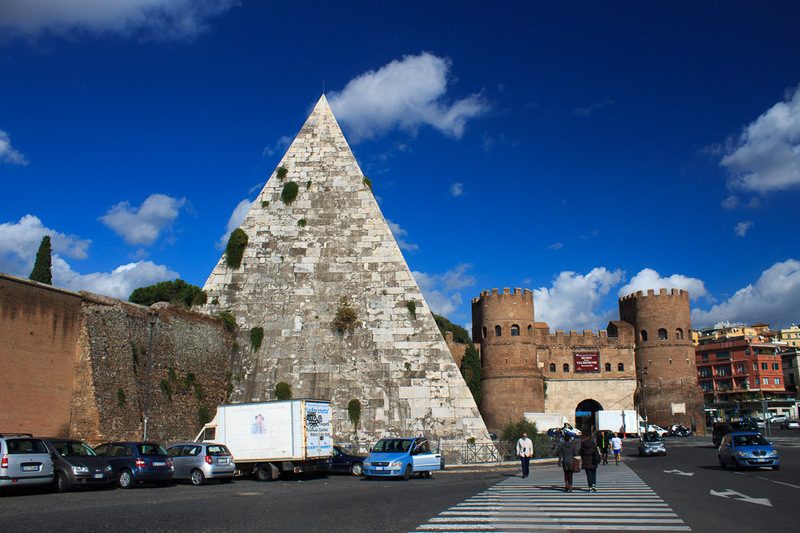 Nearby is the Protestant Cemetary, the Pyramid of Cestius, and the very worthwhile Central Montemartini Museum is a 15 minute walk south along Via Ostiense. See all Porta San Paolo photos. Hours: Viewable at any time, museum hours are Tuesday - Sunday 9:00 AM to 2:00 PM. 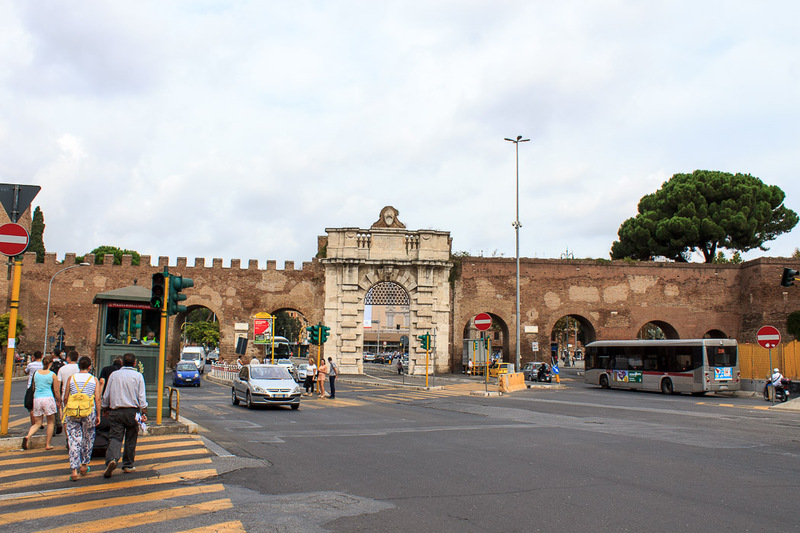 Once called the Porta Appia, the now-named Porta San Sebastiano gate in the Aurelian Wall still stands with modern traffic flowing under it and a museum dedicated to the construction of the walls upstairs. The gate is made of brick and has imposing turrets. 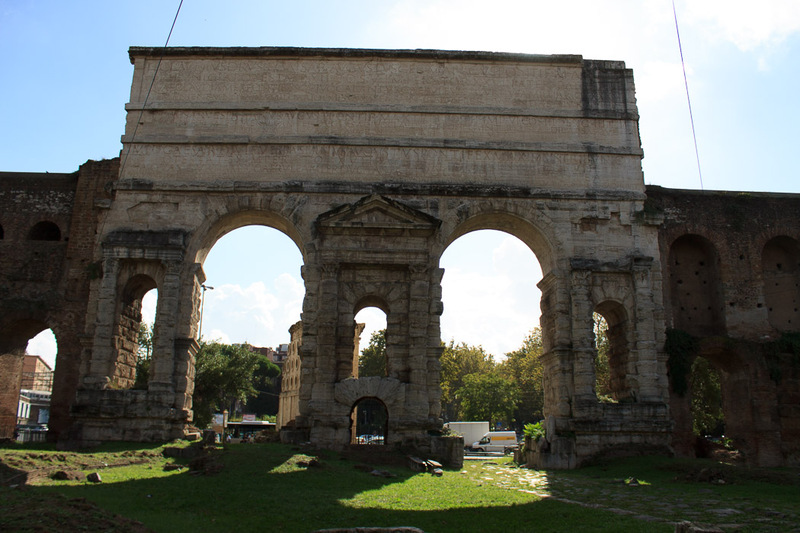 The Arch of Drusus stands just inside the city from the gate, visible through the gate in the 3rd photo below. 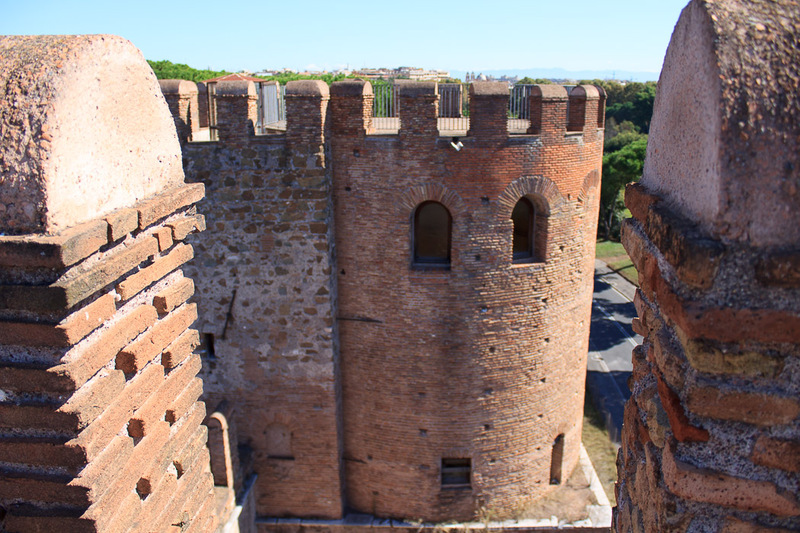 The city's Wall Museum lets you go up into the towers and walk along the inside of the wall for almost a quarter mile, has a few exhibit rooms about the walls, and lets you climb on top of Porta San Sebastiano. The entrance is just inside the gate. 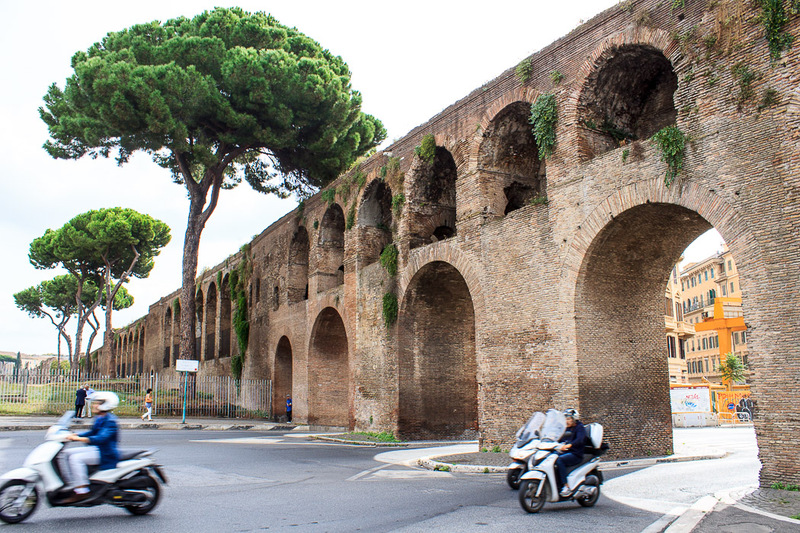 The Viale delle Terme di Caracalla leads up to the gate, but the road's name changes when it passes under the gate into Via Appia Antica, the famous Appian Way which continues 400 miles to the south of Italy. 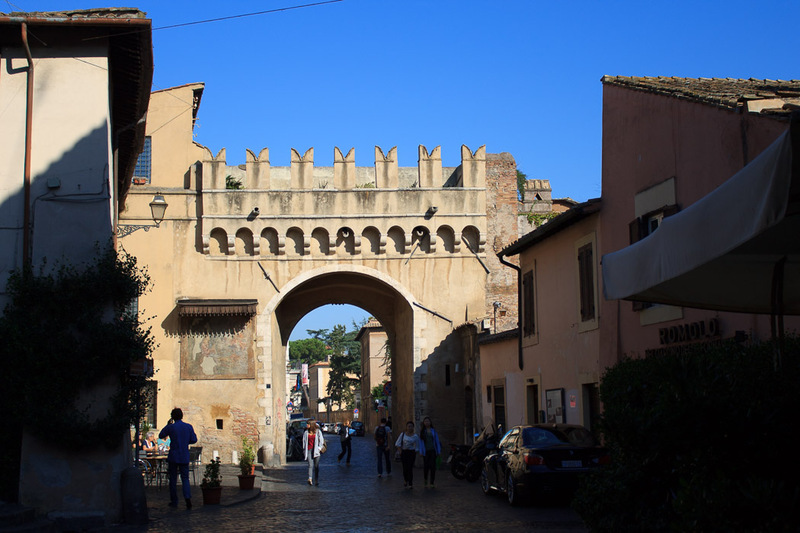 The Fountain of Porta San Sebastiano is right across the busy street. 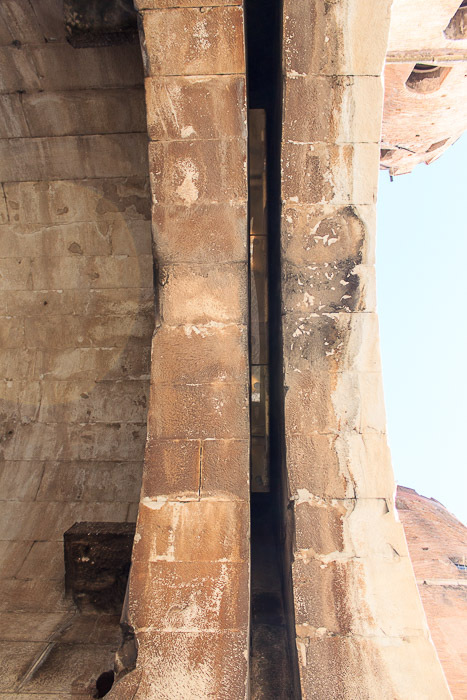 See all Porta San Sebastiano photos. 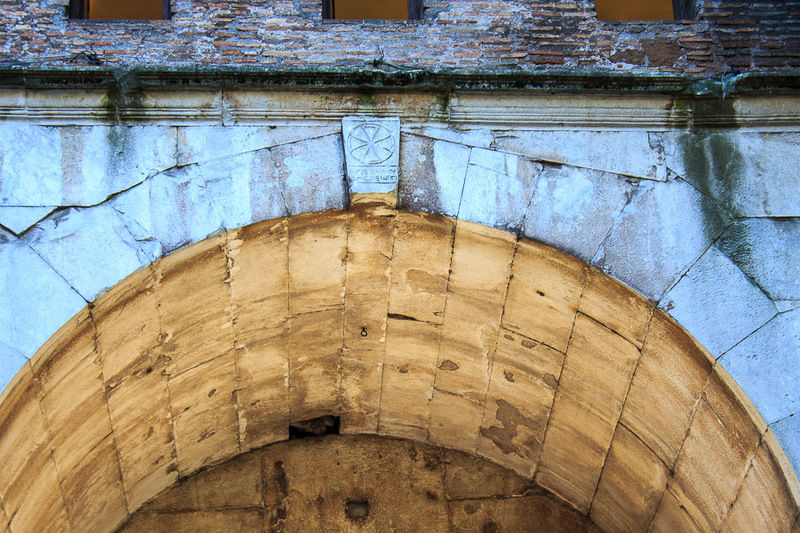 The ceiling of the gate of Porta San Sebastiano, from inside the gate, and the keystone above the arch. The Greek sentence below the Greek cross the keystone thanks the Lord and patrons of the army, placed in the 6th century by a byzantine general who conquered Rome during the Greek-Gothic war. 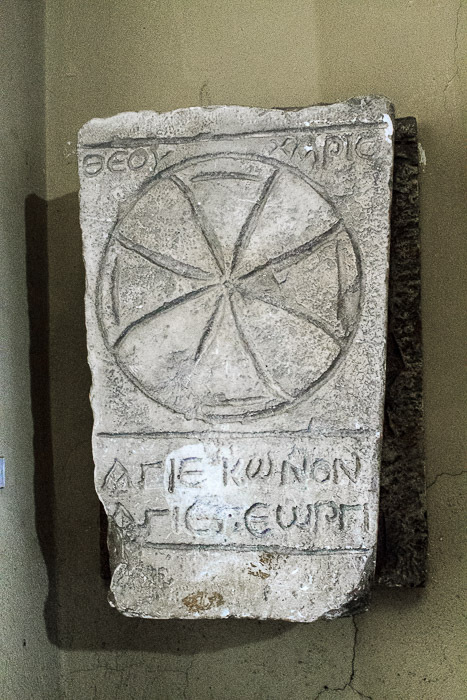 A cast of the Greek cross on the inside keystone of Porta San Sebastiano, on display in the Museum of the Wall. 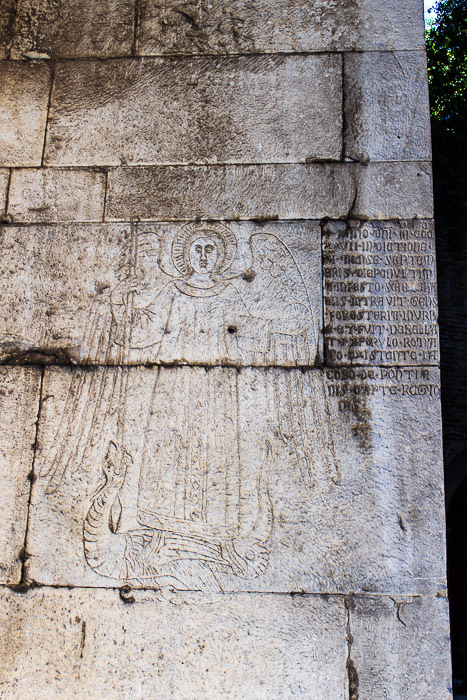 The Greek sentence below the Greek cross the keystone thanks the Lord and patrons of the army, placed in the 6th century by a byzantine general who conquered Rome during the Greek-Gothic war. Metro: About the same distance from Circo Massimo, Pyramide, and San Giovanni. One way to get there is ride the metro to Circo Massimo, walk away from the Colosseum to the bus stop heading toward the Colosseum, get on bus 118 (P.LE Ostiense (MB)) 7 stops to Cameria. 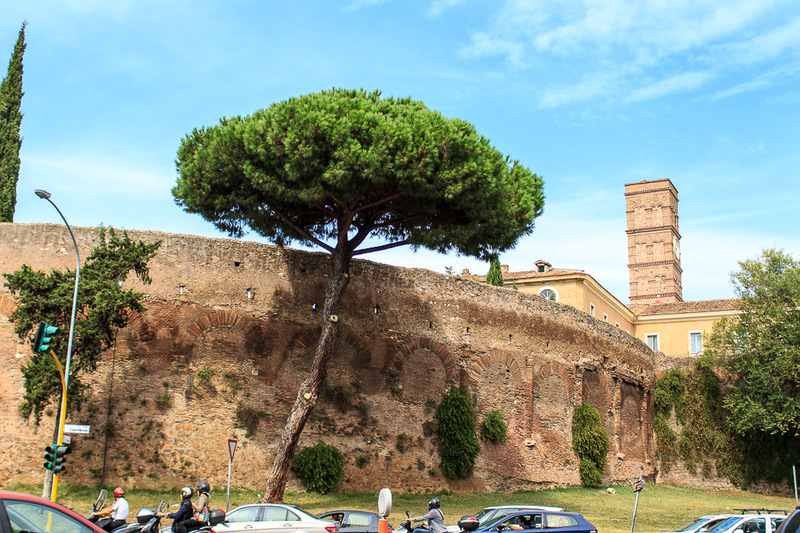 From there, it is a short walk to where Via Latina crosses the Aurelian Wall. 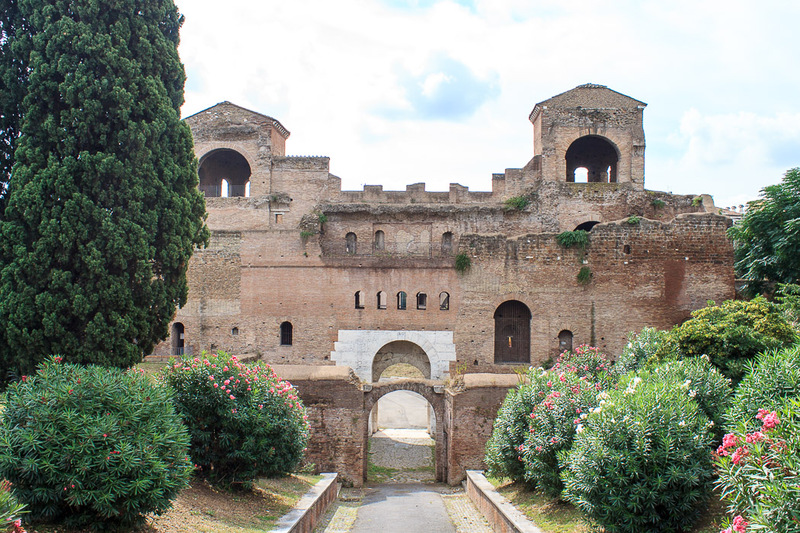 Porta Latina is a single-arched travertine gate with a brick tower on each side in southeast corner of the Aurelian Wall. 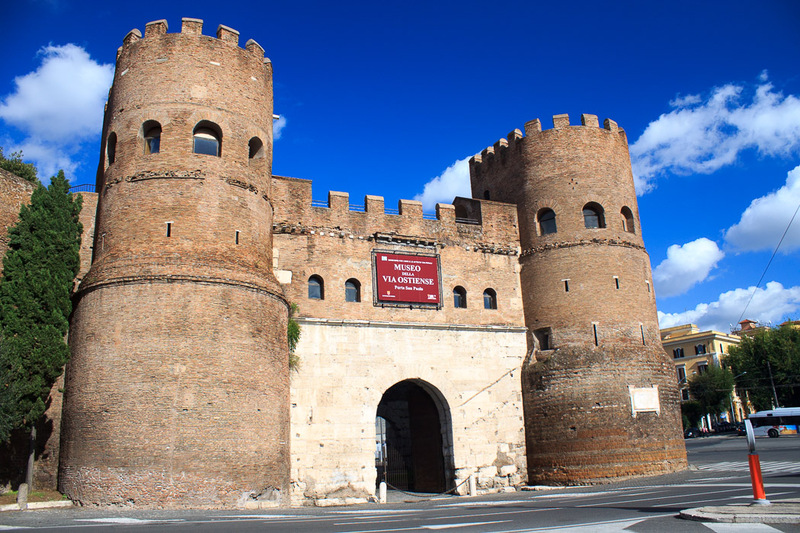 The gate is a short walk from/to Porta San Sebastiano, which houses the Museum of the Wall. 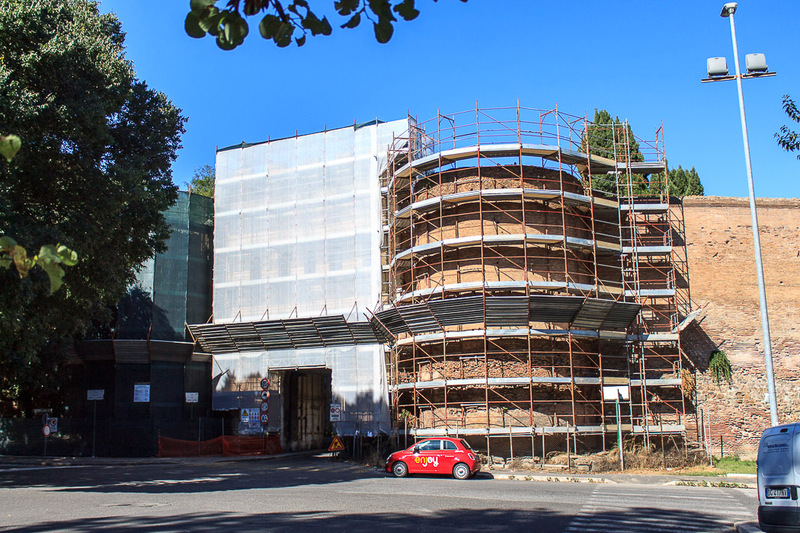 When I happened to arrive at the spot during the fall of 2014, the gate was covered by scaffolding, being renovated. I just hate it when that happens! Now I'll need to go back to Rome and find it all over again! There's an alpha and omega in the keystone on one side or the other that I'd like to see someday. Anyhow, the two utterly fascinating pictures from my 2014 visit are below. I apparently have no shame at all, posting pictures like these. 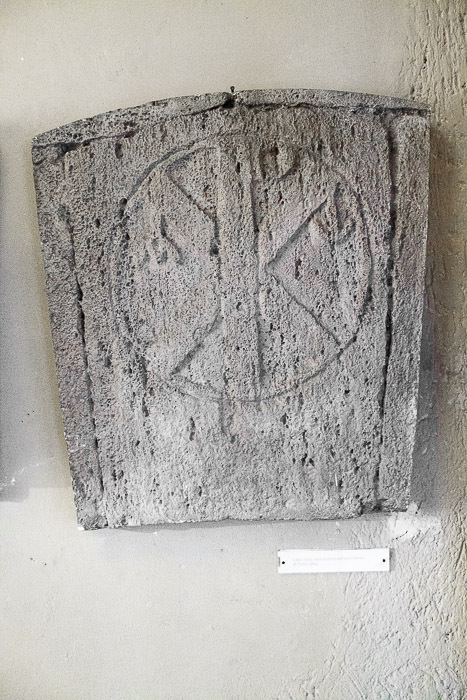 The 3rd photo is a cast of the chi-rho keystone of Porta Latina on display in the Museum of the Wall. See all Porta Latina photos. 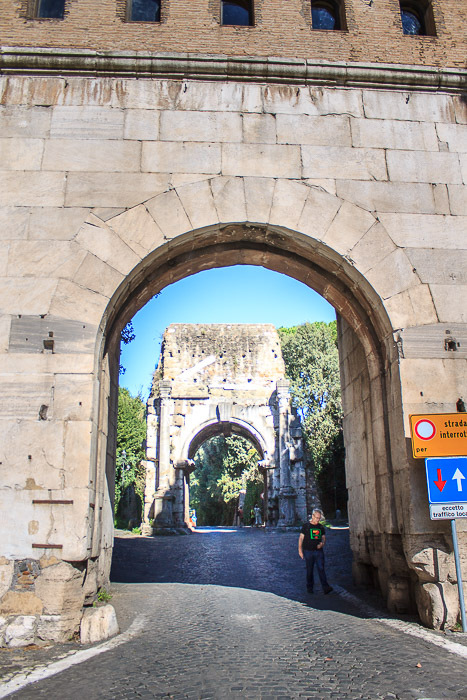 Named Porta Fmaminia in ancient times because Via Flaminia, the road from Rome to the eastern coast of northern Italy passed through it, Porta del Popolo was once a gate in the Aurelian Wall but now simply stands at the northern edge of Piazza del Popolo. 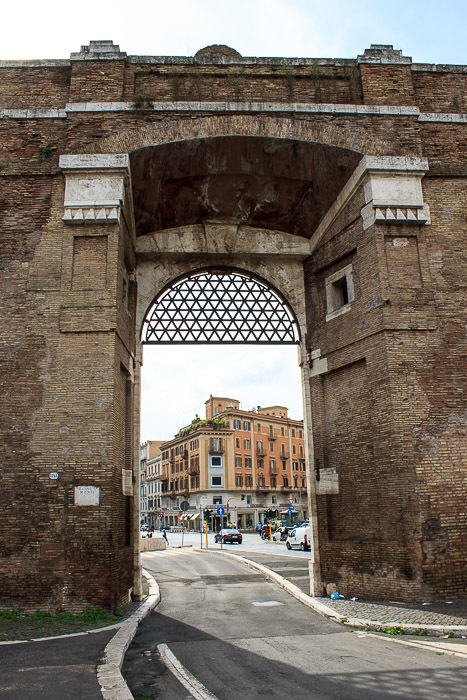 It is thought to have originally had two archways due to its use mainly to sort traffic entering Rome from the north rather than as a defensive gate. 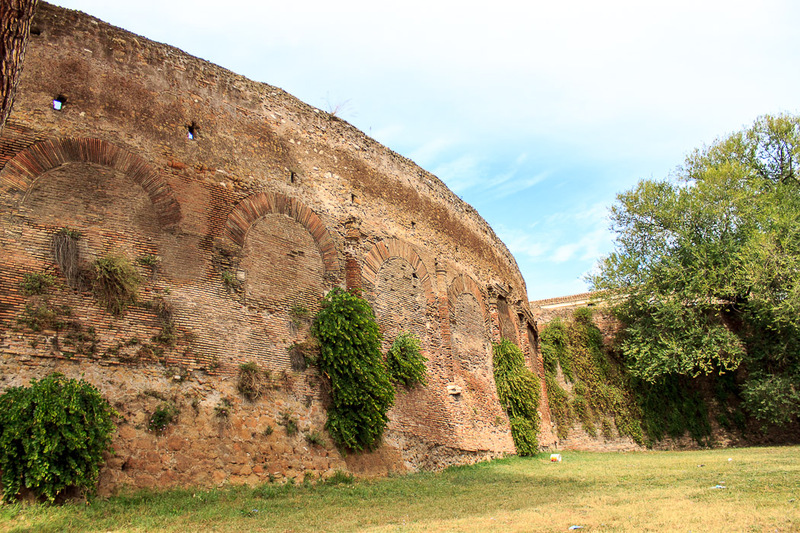 Until 1879, it also had two cylindrical side towers like the rest of the gates in the Aurelian Wall. 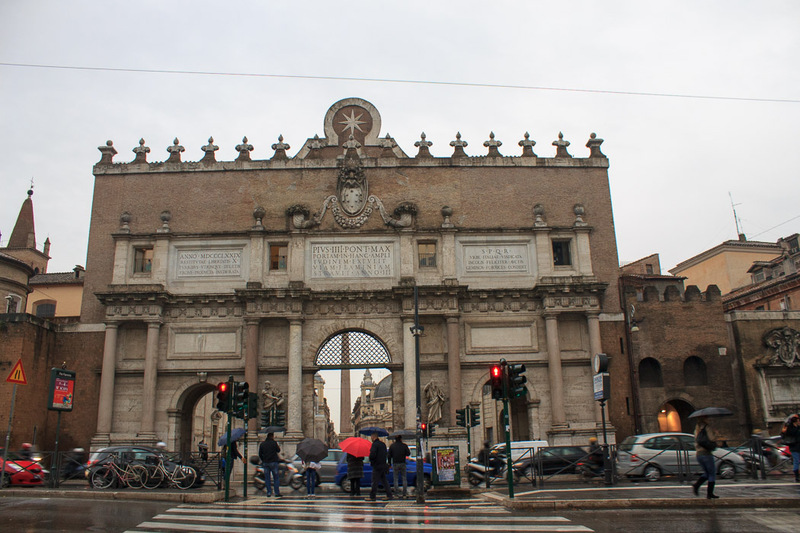 The current Porta del Popolo was built by Pope Sixtus in 1475 on the site of the ancient Porta Flaminia which was partially buried because the level of the ground had risen since ancient times due to floods. 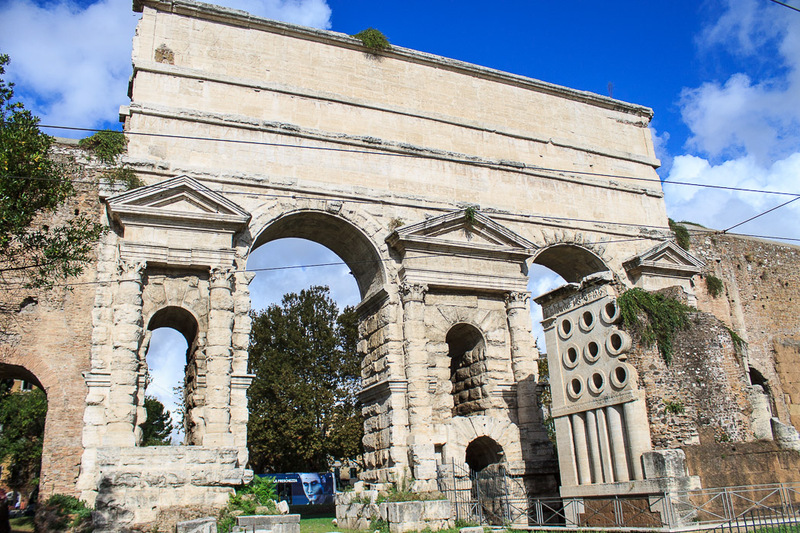 The decoration of the outside of the gate was designed by Nanni di Baccio Bigio with the advice of Michangelo, taking inspiration from the Arch of Titus. 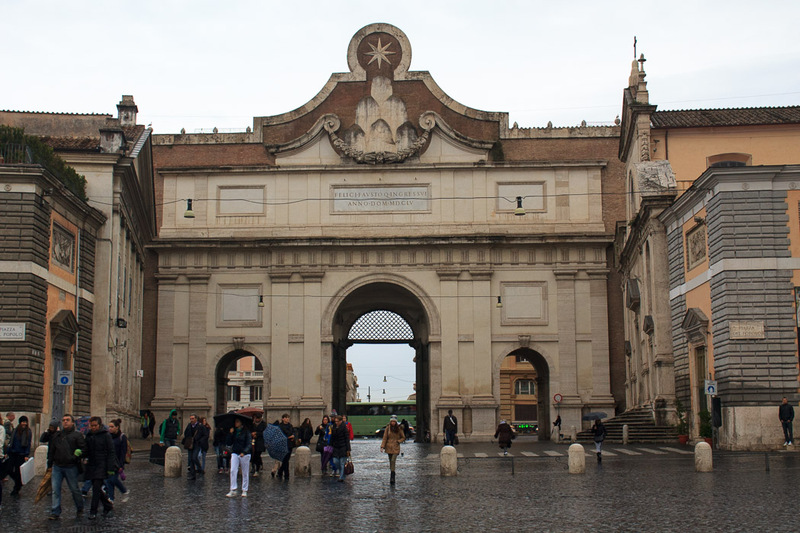 The four columns surrounding the central gate came from the former St. Peter's Basilica. The circular towers from ancient times were replaced with square watchtowers. The decoration of the inside of the gate was designed by Gian Lorenzo Bernini to celebrate the entrance of Queen Christina of Sweden into Rome on December 23, 1655. The statues of St. Peter and St. Paul at ground level on either side of the main arch were added in 1638 by Francesco Mochi. Those statues had ben rejected for the basilica of St. Paul's Outside the Walls and given back to the sculptor without payment. In 1879, the square towers were demolished and the two lateral archways were opened to accomodate the increase in traffic. See all Porta del Popolo photos. See all Porta del Popol photos. 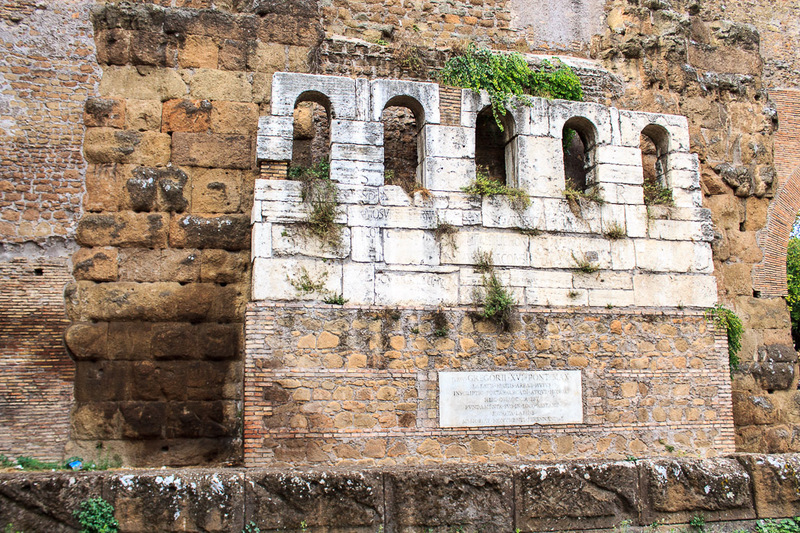 Septimius Severus had built a set of baths in Trastevere which have not yet been located exactly, but this spot held the entrance to those baths. 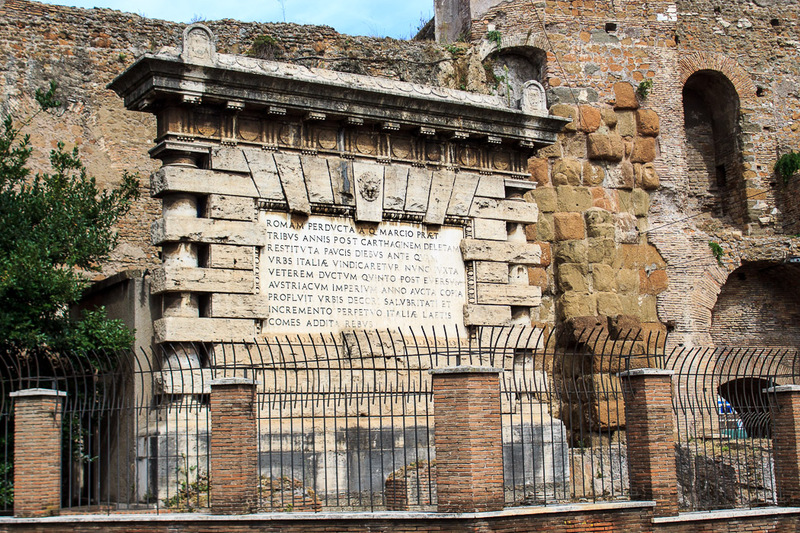 When emperor Aurelian protected Rome with new Aurelian Wall in 275, it became a gate in those walls. Then the gate was rebuilt in 1498 by Pope Alexander VI in its current form. 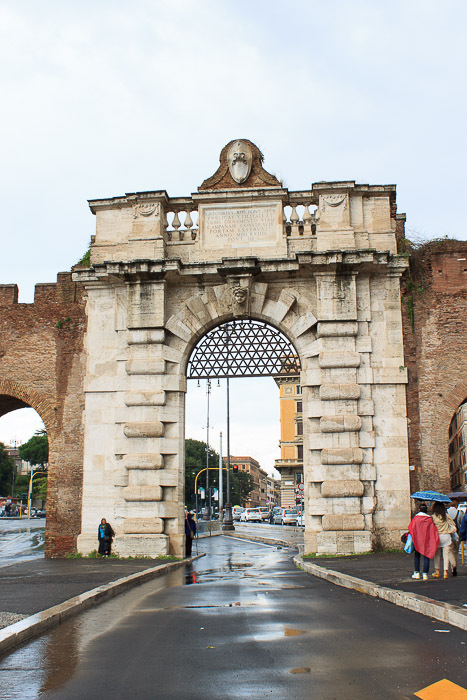 It is named Porta Settimiana after Septimius Severus. 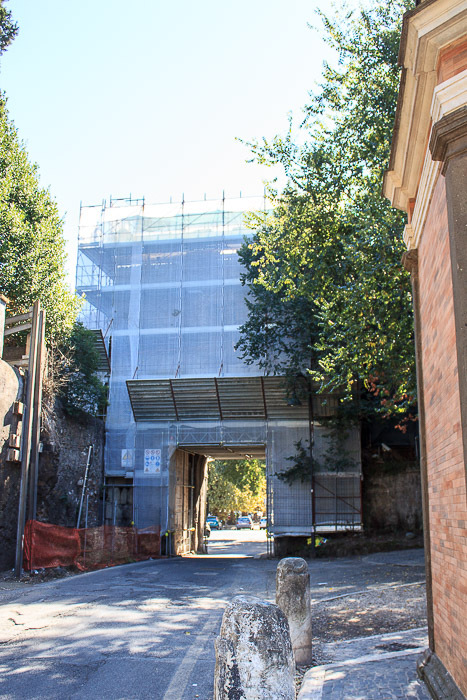 It marks the start of Via della Lungara, the 16th century road that connects Trastevere with the Vatican area. Since a parallel road carries most of the traffic, the gate has not needed enlargement and appears today as it was built in 1498. 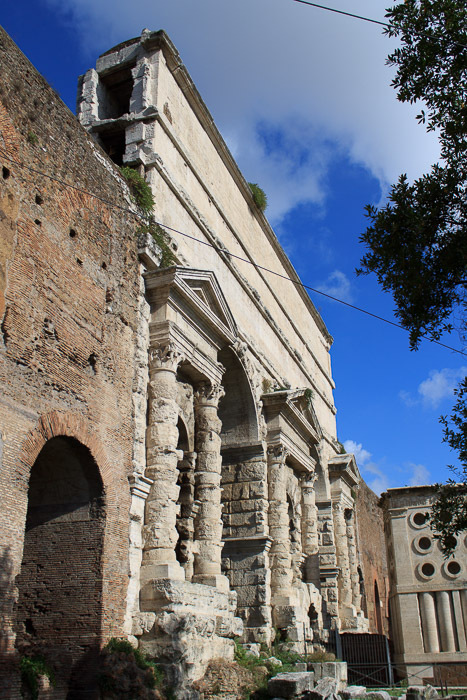 See all Porta Settimiana photos. 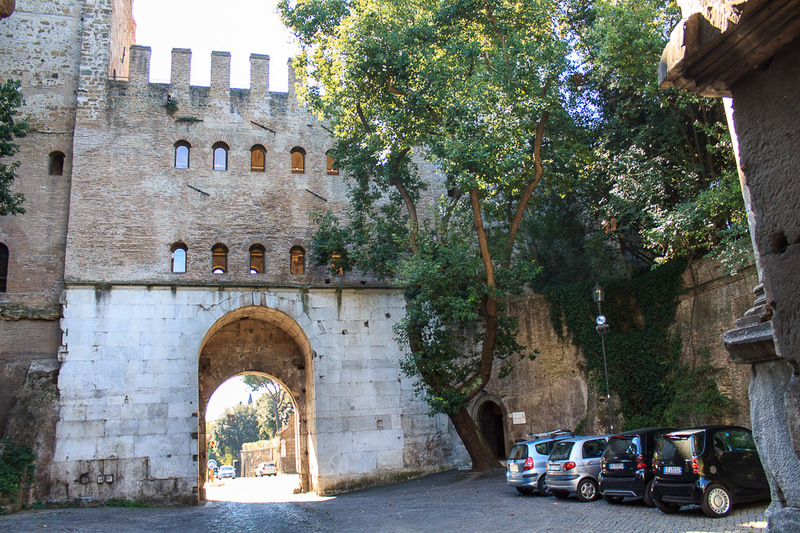 Porta Pinciana is the gate where Via Veneto enters the Villa Borghese. 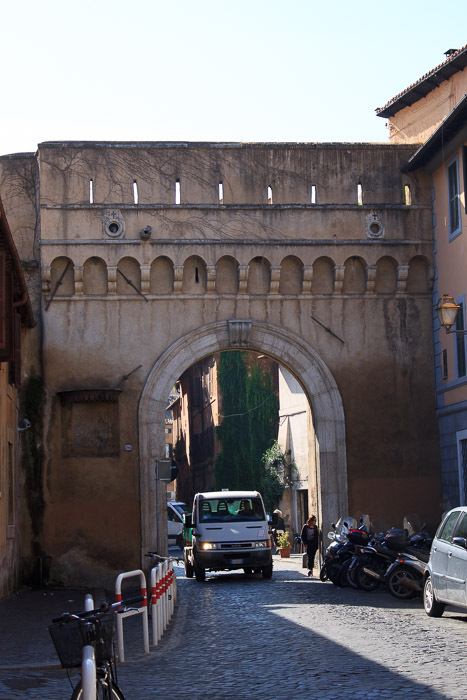 It was the gate through which Aleric and his army of Goths entered Rome in 410 AD to sack the city.